In this lesson, I’ll show you two methods you can use to read files. The first one will read a file line by line and display it on a worksheet. The second way will retrieve the specific data from the text. 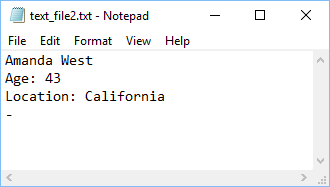 Let’s read text from the file. Open VBA Edit (Alt + F11) and insert the following code. First, a new file is created from a path and the FreeFile function. 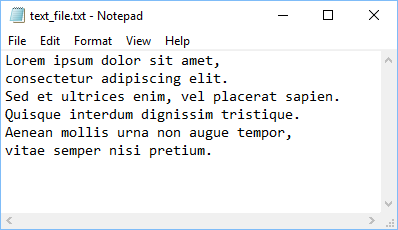 The while loop reads a line inside the file. 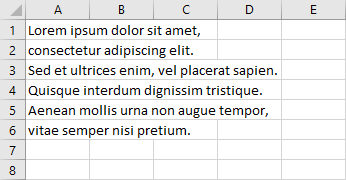 It uses the Line Input statement to insert this line into a variable and then places it inside a worksheet. It starts from the first row (A1), then A2, A3, etc. until it reaches the end of the file. Let’s take a look at the next example. Then we are going to display it inside a worksheet. In this example we asses that the data is consistent. The first line is always separated by a space and consists of two words. This loop, similarly to the previous one, is repeated until it gets to the end of the file. But there is little more that is going inside this loop. The first IF checks whether we are inside the first line. If it’s true, it splits the file into the First name (name_array(0)) and the Last name (name_array(1)). Then, there is the second IF, which checks whether we are inside the second line of the file. If it’s true, the InStr checks the position of the string “Age: ” inside the text_line variable. If the position is not 0, that means the string exists in this line. Now, the Replace function replaces “Age: ” to “”. In other words, it removes “Age: ”. The similar situation is inside the third IF. This time for “Location: “, instead of “Age: ”.